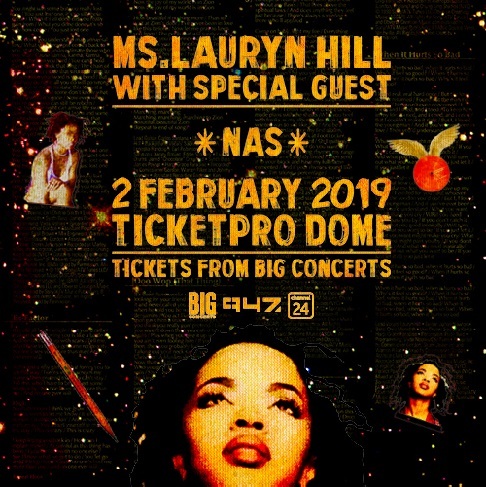 Ms. Lauryn Hill today announces the addition of a South African date to her newly announced World Tour, celebrating twenty years of her anthemic debut solo album The Miseducation of Lauryn Hill. The GRAMMY ® Award-winning artist will kick off the European leg of The Miseducation of Lauryn Hill 20th Anniversary Tour this winter on 18th November in Brussels, before the tour continues through, France, UK, Ireland, Holland, Denmark, Sweden before culminating in Norway on 11thDecember. She will perform in Johannesburg, South Africa on 2nd February 2019 at the Ticketpro Dome. Don‘t miss your chance to see Ms. Lauryn Hill on tour with VIP packages that can include a photo op with Ms. Lauryn Hill, a chance to watch a portion of the show from the wings of the stage and a special selection of merchandise. VIP packages will be available for a limited time through www.MsHillVIPs.com and Live Nation. Multi-platinum artist Ms. Lauryn Hill rose to prominence with The Fugees and took the world by storm two decades ago as a solo artist with The Miseducation of Ms. Lauryn Hill. Singles including “Doo Wop (That Thing)” and “Everything Is Everything” catapulted her to superstardom, ultimately lauding her with ten GRAMMY ® nominations and five GRAMMY ® Award wins.